Central banks came to the rescue again last Friday with news of monetary stimulus coming from China and Europe. China announced it will cut interest rates and inject liquidity into their banking system and European Central Bank’s Mario Draghi was ready again to apply "all means necessary" to meet inflation targets. Asset classes that often work in opposition marched in step - the DOW and S&P 500 set new highs, the U.S. dollar surged and gold rallied above, then closed just below, the key $1,200-level. Notably, Comex gold recovered nearly all its losses for the year - $1,198.4 versus the 2013 close at $1,202.3. Most importantly, the yellow metal is now positioned very strongly relative to silver and industrial commodities copper and oil. As shown in Fig. 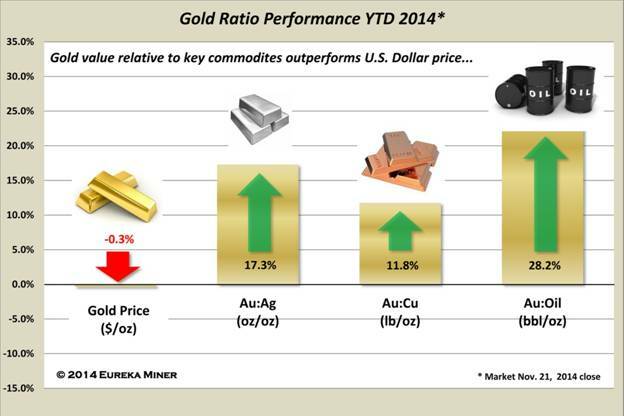 1, gold value is up 17% compared to Comex silver, 12% versus Comex copper and 28% versus Nymex oil. As described in my August commentary, Oil, Copper & Gold on a Slippery Slope, I use gold ratios to directly value gold, a technique as old as the Phoenician trader’s barter, “this much copper for this much gold.” For example, the dollar price of gold divided by the dollar price of the red metal gives a valuation of so many pounds of copper for one ounce of gold. Conveniently, currencies disappear from such comparisons. When gold price trades at a premium to this basket of commodities the blue trace is above the red; at a discount, the blue trace is below. The commodity value of gold reached $1,838.5 per ounce in April, 2011 just after the start of the “2011-2012 China Syndrome” (light yellow box). This was the time when China’s voracious appetite for raw materials peaked: driven by China demand and the inflationary tailwinds of QE2, copper enjoyed $4-plus per pound prices and iron ore topped $190 per metric ton. Arab Spring was also in full swing moving WTI prices above $110-per barrel on supply disruption fears. Although gold traded at $1,500 per ounce, it priced at a discount to both copper and oil in terms of historical ratios. The tables turned after the disastrous U.S. debt downgrade that August - gold was propelled to premium on a safe haven play as oil and copper prices fell. On a closing basis, Comex gold peaked in late-August at $1,891.9 with its intraday all-time record of $1,920-plus per ounce following in early September. Notably after 2012, gold took a plunge from $1,675 to present levels with a procession of lower highs and lower lows. As the yellow metal entered a bear market in 2013, money rotated away from safe haven assets to blazing equity markets. Today copper struggles to hold $3 per pound, iron ore trades at $70 per metric ton and oil has fallen to $75-80 per barrel territory. China’s waning appetite for natural resources, European recessionary/deflationary fears and regional conflicts have taken their toll on commodities bringing gold’s commodity value down with dollar price. This forms a declining value wedge (Fig. 2 dashed red lines) that gold dollar price has not strayed far from since April 2013. The wedge is therefore quite useful in predicting future price ranges. Extending the dashed lines suggests a commodity value range of $990 to $1,170 per ounce for next year’s first quarter. Is gold still on the slippery slope? The connection between the price of gold and key commodities works much like the force of gravity. Without the propulsion of safe haven or monetary hedge, the yellow metal falls back in line with commodity prices and historical norms. 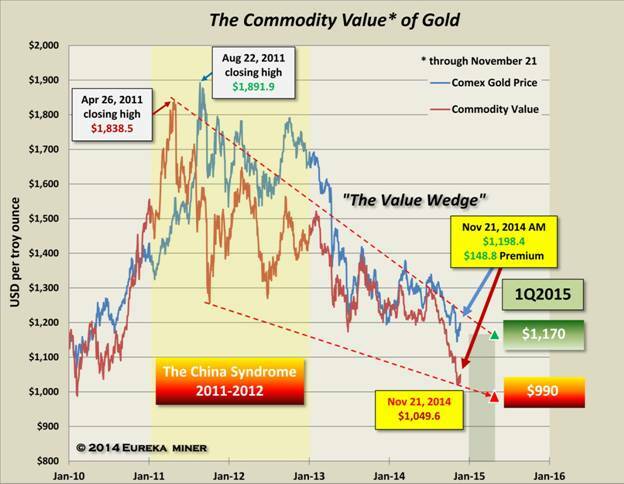 Since 2011, both commodities and the yellow metal have been on slippery slope. A positive sign is the healthy premium that gold currently has relative to the aggregate of oil, copper and silver – nearly $150 per ounce at Friday’s close (Fig. 2). 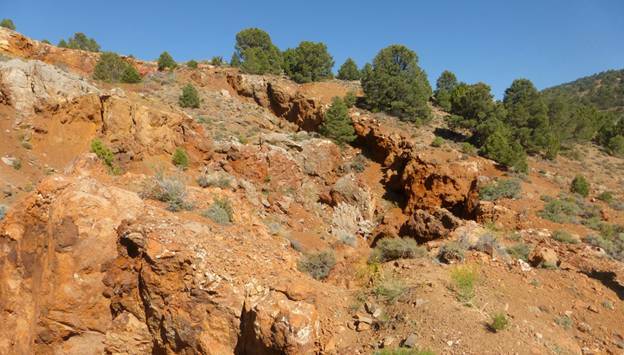 The recent stimulus-induced momentum may bring gold to the upper boundary of the "value wedge" in Fig. 2 or $1,220 per ounce. Without additional catalyst, this may be to the short term top. If commodities can rally higher gold may too, breaking the curse of the declining wedge. If not, gold could fall within a $990 to $1,170 per ounce range in the first quarter of next year.